This is a guest post from a reader who broke into Sales & Trading (S&T) coming from a non-target school. In Part 4 of this series, you’ll learn all about sales & trading interviews and how to tell your story and answer “fit” questions. It was a Wednesday night, and I was staring at the email I had just received from a bulge bracket bank. “Yes” was the only logical response… followed by a lot of freaking out. Since I was from a complete non-target school, this would be one of my few chances to interview at a top bank – and I was up against people with a lot more resources and experienced mentors at their disposal. Oh, and then there was the fact that I only had one week to prepare. My interviews didn’t go so well at first, as I learned the ropes of how to present myself and the questions to expect. Eventually I turned it around and landed a sales & trading offer at a top bank – here’s how I did it, and how you can do the same. The good news about interviewing is that it’s a skill, and with the right amount of practice and effort you can master it. And unlike with networking, you can actually improve your odds quite a bit at the last minute with solid interview prep. Understand the qualities they’re looking for. Know the questions you’ll get. Prepare your “story” and answers to the most common questions. We’ve already covered the most important qualities in sales & trading resumes: quantitative ability, analytical skills, and passion for the financial markets. Can this person think very quickly, without hesitation? Can he/she take risks and act appropriately even when things don’t go their way? Is this person nervous in the interview, or can they handle the pressure? Can he/she think differently from everyone else and come up with strategies and ideas that go against the mainstream? Does this person want to do sales & trading specifically as opposed to related fields such as asset management? You need to incorporate these qualities into your responses. Market – Everything from discussing market trends and current events to pitching stocks and trading strategies. Brainteasers / Math Questions – What’s the square root of 58? How many smaller cubes are painted on 2 sides in a large cube made up of 9 smaller cubes on each side that’s painted on the outside? What’s 57 x 83? The technical questions on accounting, valuation, and financial modeling you’d receive in investment banking interviews or PE interviews are uncommon here. They’re more likely to focus on basic concepts such as market cap and basic multiples like P / E, rather than the in-depth trade-offs of different methodologies and models. Generally, your first round interviews and phone interviews will be very fit-based, and your Superday interviews will be much more markets-based – but definitely expect some market questions on the phone interview, and some fit on the Superday. In this article, I’m going to focus on the first category above: fit and behavioral questions (market and brainteaser/math questions will be coming up in the next part of this series). People underestimate these qualitative questions because they don’t involve math, but that’s a huge mistake: if you don’t get your “story” straight and don’t convey the qualities they’re looking for you’ll never make it past the first round. You can use the same outline in S&T interviews, but your focus will be slightly different. In banking interviews you can get away with saying something open-ended for point #4, such as “wanting to advise companies” or “wanting to become an investor,” but those are poor answers in S&T interviews. While this demonstrates interest in the financial markets, it does not show that you are specifically interested in sales & trading – that answer could apply to asset management, equity research, value-oriented hedge funds, or plenty of other fields. Plus, sell-side traders don’t even “research” stocks and make decisions that much unless they happen to be prop traders… and even there, there’s still overlap with market-making and client work. Pick a specific product to talk about such as options, other derivatives, commodities, FX swaps, etc. – and make sure you know the in’s and out’s of that product since you will get follow-up questions. Talk about how you enjoy the results-driven environment – having a personal P&L makes it different from equity research. The “Beginning” – Grew up in [Country / City] and went to school at [University Name], majoring in [Major Name – hopefully something technical!]. Your Finance “Spark” – You won 1st place in a trading competition by analyzing the airline industry and longing a stock that rose 20% and shorting another one that fell 15%. Your Growing Interest – You started out doing an internship in PWM and liked the markets-based work, but wanted to work in an environment that’s more results-oriented… which led you to a small hedge fund where you focused on currency swaps and learned all about strategies there. Why You’re Here Today – You’re passionate about the financial markets, making trade decisions, living and dying by results, and in swaps of all kinds and you want to work on a bigger scale than you did at the hedge fund. Your Future – Trading is your passion and you want to make a long-term career out of (swaps, or whatever product you’ve mentioned) and think that this bank provides the best environment for that. You ramble on about wanting to “help clients” or “be in a fast-paced environment.” Those are fine to mention, but your answer needs to be more than that. You fail to distinguish between S&T and related fields (see above). You mistakenly think that you’re in a banking interview and give overly broad reasons for points 4 and 5 above. Other “fit” questions are similar to what you’d get in any finance interview: your experience working in teams, your strengths and weaknesses, cultural fit, background, commitment, and so on. Those have already been covered on this site many times, so I’m not going to repeat all the details – instead, I want to focus on the differences and how you should tweak your responses in S&T interviews. You should use the PAR (Problem/Situation, Action, Result), otherwise known as STAR (Situation, Task, Action, Result) framework, to answer these questions. Focus on behaviors (i.e. what you actually did in a given situation) rather than inferences (assuming something based on what you did). Q: Tell me about a problem you faced and how you dealt with it. Problem: Advertising revenue was falling for my college newspaper, “The Paper,” and many advertisers were not renewing their contracts. Action: I designed a new promotional packet to go with the rate sheet, and compared the benefits of advertising in “The Paper” with other ad media in the area. I also set up a training session for the account representatives with a professor who discussed competitive selling strategies. Result: We signed 20 contracts with former advertisers and increased our ad revenue by 20% within the first three months of creating the promotional packet and setting up the training sessions. Remember the qualities above that they’re always looking for: passion for the markets / trading, quick-thinking, ability to measure risk and handle defeat, grace under pressure, and unique thinking. You should go through your resume/CV and find 5-6 stories that best demonstrate these qualities. The example Q&A above is “good,” but it would be even better if it showed off some of those traits: for example, maybe you came up with a really different advertising method, or you were under much more pressure to perform, or you had a very tight deadline and had to apply quick-thinking to the situation. You came up with a contrarian strategy in a stock investing competition and placed well as a result. You were under pressure to turn around a student club before it ran out of funds in a matter of weeks, and came up with a creative solution that saved everyone. You evaluated the risk of a new business you were starting, and hedged your risk by taking some other action. You analyzed a client’s portfolio and came up with new strategies that earned him above-market returns – even though he thought it was too risky at first. You were losing a debate competition, but you thought quickly on your feet and found a way to spin your opponent’s argument around that allowed you to come back from behind and win. Go through each bullet point you have on your resume and sketch out what you’re going to say to best demonstrate these qualities – and plan out how you’ll apply the same few stories to answer all types of “fit” questions. Unique “Fit” Questions for S&T? Beyond the normal questions, you’re also likely to get “What would a trader do?”-type questions. Cutting losses is extremely important in trading, and so that’s exactly what you would do here… but you should also back it up by pointing out how you’ve cut losses in the past, with trading itself, a school or work project, or anything else. Asking about investments and strategies gone wrong is a popular topic here because it’s easy to come up with “unique strategies,” but much harder to adapt when your strategy fails and you need to fix it. You’re also likely to get questions on sales vs. trading, equity trading vs. fixed income trading, and your desk preferences. These questions are more about knowing what you do in each group and how different desks differ rather than coming up with earth-shattering insights. For example, you could say you’re really interested in fixed income because you like credit analysis and following corporate news (if you want to trade corporate bonds rather than government bonds); or you like equities because you enjoy coming up with different options trading strategies. But be sure to express your openness to anywhere in the firm that you can learn the most – this is especially important if your interviewer is in equities, but you know you want to do fixed income. Placement usually comes later on, so you’re best off not offending your interviewer because there is a HUGE divide between equities and fixed income. As mentioned in the previous article in this series, you apply for sales & trading roles without specifying a desk or role upfront. Sales is better if you enjoy the markets but like pitching your ideas and developing relationships more. Trading is better if you also like the markets but enjoy the technical side and making trades more. The actual “fit” questions you’ll get after you’ve specified which role you want are not radically different because the skill sets overlap. The main difference is that they’ll focus more on your communication skills in sales, and whether or not you can explain complex ideas simply. Many of your clients won’t understand extremely complex strategies, so being able to break down arcane ideas into understandable chunks is essential. Once you’ve figured out your main “story” and collected 5-6 supporting stories, you need to get to work practicing. I did everything imaginable, from recording myself to sketching out my answers to doing mock interviews with older classmates and friends who had been through the recruiting process. You do get diminishing returns after enough practice, so you don’t want to over-do it… if you’ve already done 15 practice interviews, you’re not likely to learn much more from the 16th one. And you should never give scripted answers because they sound very artificial – rely on outlines rather than pure memorization, and try to change up the details of what you say each time. Recording and playing back your answers to yourself may scare you at first, but it’s a great way to evaluate what you sound like and what you need to improve upon. By the time my real interviews started, I already knew what I had to pay attention to and where I might screw up. You should be wearing a dark suit, with a modest shirt and tie combo. Make sure your hair is neatly groomed, you are clean-shaven, and you smell clean (cologne/perfume is okay, but don’t overdo it). You should even shine your shoes. Having you suit dry-cleaned is not a must, but for a few bucks it’s a worthwhile investment. It will help you look and feel like a million bucks. And if you’re female, wear the equivalent business formal attire. Attitude is an extremely overlooked part of preparing for behavioral questions. Enthusiasm and passion are key, not just for financial markets, but for S&T and the firm in general. If this is the job of your dreams, then psyche yourself up about the possibility of reaching your goal – if you can’t easily do this, then is S&T right for you? During my interviews I was constantly smiling, and my interviewers always mentioned my enthusiasm in their comments to me. Confidence is also important: your posture and speech, and non-verbals convey confidence, so make sure you speak loudly, make frequent eye contact with the interviewer, and sit up straight. With a phone interview, I recommend standing up while on the phone to convey confidence. Having possible questions and answers in front of you (sketched out, not word-for-word) will also help. Before all my interviews, I would stand in front of a mirror and pump myself up, tell myself that I was a great candidate and so on (yes, I made sure that no one else was watching) – it sounds stupid, but it worked very well on a subconscious level. It is perfectly fine to say “I am really not 100% sure about that, can I get back to you?”… the key is to make sure you then follow-up with your interviewer. Don’t ever BS an interviewer – they can usually smell your lies, and it’s the quickest way to lose your shot at the job. This mostly applies when you are answering technical questions and you get something very detailed. If you don’t have an answer for “Why S&T?” or “Tell me about a team problem you’ve overcome before” then you shouldn’t even be in the interview. When the interview comes to a close, the interviewer will ask if you have any questions for them. The close is all about expressing to the interviewer your enthusiasm for the job – and making sure they know that you are the right fit. You should only do this if you are willing to back your words with actions, but it worked very well for me. Without going into great detail – the thank you note is a must and it should be sent via email within 24 hours of your interview. Thank the interviewer(s) for his/her/their time … and bring up something from the interview that will allow your interviewer to remember you. If you told them you would get back to them about a specific question or if there was something that you forgot to tell them about/ ask them, the thank you letter is great medium. Tell them you look forward to hearing from their firm and are excited for the opportunity to work with them in the near future. NOTE FROM BRIAN: I realize I’ve said before that Thank You notes don’t matter. In many interviews, they won’t make a difference because hiring decisions are made quickly… but you never know. It never hurts to send a short follow-up note, especially if you want to remind them of something specific. Just make sure you do it quickly. Finally, maintaining low expectations walking into an interview can help you a lot. If you walk in expecting to win an offer instantly, you’re bound to be disappointed many times… but if you go in expecting nothing but hoping that you’ll do well and at least improve your performance this time, you’ll be in a much better state. You will rarely, if ever, win an offer on your first try – keep at it, and if you really think you were judged unfairly, don’t hesitate to petition for a “do-over” no matter how big or prestigious the firm is. That’s the first part of how to dominate your S&T interviews and how you should approach fit and behavioral questions. Coming up next, we’ll conclude this series with one of my favorite topics: markets and math/brainteaser questions – and you’ll learn how to prepare, how to practice in advance, and yes, even how to calculate the square root of 58 in your head. This is a guest post from a reader who broke into Sales & Trading (S&T) coming from a non-target school. In the upcoming features in this series, we’ll continue to explore the sales & trading recruiting process with coverage of interviews and more. Is there a way you can review my resume and maybe give advice for how I can walk through it best for S and T super day this Friday. We don’t provide free resume reviews on this site, but if you are a customer of our courses, feel free to ask for feedback inside the BIWS site or via the contact form there. I’m interviewing for an internship position for a generalist division at a BBIB that is composed of both sales and trading and equity research. Any tips on how I should be approaching this one? As useful as these tips are, I’m afraid of leaving the interviewers the impression that I only want to work in sales and trading. Since if I’m successful, I’ll be doing a rotation across both S&T and ER. Well, of course, the article is geared toward sales & trading (hence the name), not S&T + equity research. Basically, you should emphasize that you still like the markets and follow companies and major trends, but don’t talk about specific products (such as types of derivatives) as much as you would for a pure S&T role. Very useful article I’ve to say. Thank you very much for that. I get an interview for a Sales Trader position on Equity Derivatives in a bank (graduate level), and would like to know the 5 most common technical questions you would think about? Just to have an idea. For equity derivatives, they could easily ask about options, Black-Scholes, different strategies involving options, and so on. I just had my super day for a sales and trading position at a middle market firm. I should be hearing results in a few days and I think the interview went decent (wasn’t able to get every brain teaser but I think I was able to justify my thought process), got all markets based questions right, and had one or two behavioral questions I couldn’t really relate to so had to come up with some answers on the fly (not sure if the interviewers liked or didn’t like my answer to these). Anyways, I happen to know one of the executive directors at this firm and I think he has been able to help me out a lot through this process so far. I was wondering how much influence based off your experience, an executive director might have on summer internship offers once I’ve finished the superday? He has some influence, but less than the interviewers do. You should definitely follow up with him and thank him again (and maybe see if he knows how the process went). I will have two interviews in the next few weeks and both of them will include so called “trading related activities”. Do you know what these are about? Yes it’s probably more fit oriented though they may also ask you questions on the markets etc. I am applying for the energy sales & trading group (commodities) for a large investment bank. I live in a city dominated by the oil and gas industry, and the bank I am applying to focuses on natural gas. I was wondering how best to convey parts 4 and 5 of my story? I am a third year undergraduate engineering student. I have experience as an engineering intern at a large, prestigious operations company, however, I do not enjoy doing technical work. Instead I enjoy learning about the bigger picture of the oil and gas business, the supply/demand/world events that drive the market, and analyzing the value of commodities and assets/land. What is the best way I can convey this to make it specific to commodity sales & trading? You can talk about what you just listed and add that you’re interested in S&T since you like its pace and the markets. You want to combine your technical knowledge, passion in commodities (you’ll need to explain this) with the markets and you believe commodities S&T is the best route to combine the three. Sqrt(58)? You can approximatively think it on the interval (7.5;8) without 8 but you can’t find it precisely. How much the last math problem is easy and the second too. It would be great if you could say me what is better,I’m going to study after this year but I’m struggling with the choice: physics and astronomy, civil engineering and management engineering:http://nl.m.wikipedia.org/wiki/Handelsingenieur . I talked to a professor and he said that the last one is praised on trading floors is a perfect choice for that. What do you think? Yes he may have a point. I’m in a difficult situation. I’m probably going to get interviews at many S&T internship roles, and I have a ton of internship experiences, with the last one with a top notch hedge fund with quite a name, but I don’t really know how to tell my story…. My resume is so…research based, and all my experiences were research heavy (perfect for ER–but I don’t want to do that). At the hedge fund, I “covered” certain industries, how do I spin that into sales and trading? 2.) Is saying you love the markets and observing market movements a great way to get attention? What should I do to improve my story? When it comes to interests, I have the following: Weightlifting, Yoga, Swimming and Astronomy and Physics… Does that sound fine.. or does the “Astronomy and Physics” part sound too nerdy? I actually learning about black hole theory and physics and quantitative field equations. No. I think they sound fine. Great article as always, you guys are great help! I am an undergraduate student studying engineering and I am trying to get a summer internship in London. I currently have a mock trading account but for some reasons it is losing money. Do you think I should mention the existence of the account? The answers to the walk me through your resume question seem more tailored towards trading. What would a good response be for 4 – 5 of that question for someone looking to go into sales? Thanks. I really liked your article and I guess you should be the right person to answer my question. I was working as Equity Derivatives analyst for 5 years. Then I shifted my role to consulting. Now I am looking to re-enter the industry. How can I go do it? Please suggest. I was wondering what your thoughts are on the recent internship interview I had at the bulge bracket firm. Some background information. I was given an interview about a month ago by the same firm for a position on a different desk – it was an interview for a few desks. 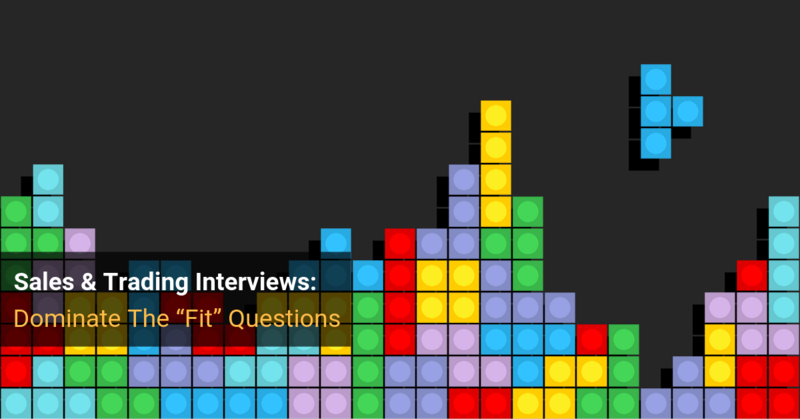 That interview had its fair share of fit questions, technical questions, brain teasers. I feel I did well, and connected with the individuals since they shared common points with me, but did not land the offer. I then applied for another position in which one recruiter I knew pushed my resume. This interview confuses me! I was the last to be interviewed before the long weekend so it may be that they already found a candidate or could it be because they pulled up my previous interviews notes? I am unsure if I should delay accepting an offer at a mid-size firm for a few days to see their decision. Hard to say – definitely follow-up with the firm and ask what is going on if you haven’t already done that. I would definitely not turn down an offer at a mid-market firm just to wait and see on this one if it comes to that. Great article as always. I just finished up my freshman year of college, and was wondering where I would actually have a chance of getting an internship next summer (2014). I joined a capital markets group at my school, read the WSJ, and have my own mock trading account. Is there anything else I should be doing to prepare for an internship next summer? I do not have any real financial experience on my resume, like a past internship, etc. Being an athlete is a HUGE edge too. Individual sports is even better. Yep this is true. Being in “masculine” team-oriented sports like rugby and basketball is attractive to many interviewers because it shows that you are a team player. For roles which involve taking risks (i.e. trading in HFs), adventure sports such as kitesurfing, skydiving, motocross, paragliding will def give you an edge. How should I convey on my resume that I am an athlete despite the fact I no longer compete competitively in college? Currently under interests I have listed “Doubles Tennis, Running, Skiing, Fitness and Intramural Sports” but I feel like this downplays my athletic prowess and competitive spirit. Sports are still a very big part of my life, although they are now just for fun, but I feel like this is not portrayed at all on my resume given the current format. Do banks only care about varsity collegiate achievements in athletics or would it be wise to list my high school achievements? My Tennis team won State all 4 year that I played and was ranked in the Top 5 in the Northeast. I was also an All-League/All-Area cross country runner (and captain) with a 5k PR of 16:33. Any time I have ever brought this up at work or in an interview it has been quite a conversation starter, so I feel like it might be beneficial to list on my resume… but then again it was in high school and now I am a Junior in college. Great article. Especially the part about after interview questions, I dropped the first two you listed in an interview today and got great responses. a paid full time position as a portfolio administrator at a small, recently established fixed income management firm that works with institutional and high net work clients, where my main duties would be Facilitating trade matching and settlement, updating models and portfolios for trades, reconciliation of models and portfolios, compliance checking, and some client facing. Which of these opportunities is a better career move? Thanks for your response, and for the great content updates. Thanks, glad to hear about the positive results. Hmm, that is a tough call… I think it comes down to whether you want to do M&A or sales & trading / asset management in the long-term. If you want to do M&A / IB, the first option is better, otherwise the second option is better. There is nothing else to say than that this post is pure gold. Great job man. Best blog i have ever read. Thanks! I love how these types of articles always get the least amount of comments. I was wondering how I should “brand” and differentiate myself in S&T interviews during next year’s recruiting process given my previous internship experiences. I am currently a Summer Analyst for a MM firm in Equity Research and worked last summer as an Institutional Equity Sales intern at a regional BB. I wouldn’t limit yourself to one or the other quite yet. Probably best to say that you like the public markets and talk about a specific industry and/or product that you’ve covered in those internships and why you want to trade or sell it in the future. Most other people won’t be able to point to experience with a specific industry and/or product in the context of real work experience like that. Fine article, really appreciate it. I just have a question about getting an internship in US. Currently, I am an international student studying in Canada and I was wondering if it’s possible for me to get an internship in US. I can work in Canada with my work visa but I have no idea how it works out in US. Is working visa required for people outside of the country to work as intern? Yes, a work visa is required for internships, which makes it tougher for you… but most large banks will sponsor you if they like you enough. The key is to convince them that you’re better than local candidates in some way. I’m going into my penultimate year now, so I’ll be applying for summer internships for the year 2013. Since, you’ve mentioned to talk about previous finance experience…etc. I would like to know if a prior internship is required to break-into the ‘Markets’ division of many banks for summer internships. Since, I’m an engineering major, I din’t really have many opportunities earler…also most of my projects I’ve done are very technical and analytical interms of engineering. Would a lack of prior experience make me at disadvantage ? You don’t need a prior internship or experience if you’re going for internships. If you’re aiming for full-time jobs, you’ll be at a big disadvantage though. Thank you brian. Also, 1 final question…where do you think engineering majors have a better edge…is it S&T or IBD? Probably S&T because advanced math skills can actually help there, depending on the desk, whereas in IB they’re marginally helpful at best. Thank you brian. That was helpful. Also, what’s your take on CMT(Chartered Market Techinician) Level 1 for students? I don’t think it’s useful or valued in trading, at least I have never seen or heard anyone talk about or mention it.